It can reduce pressure time over the traditional tape and gauze plus seals and isolates the site securely on all sides. They are versatile and may be used on most venous and arterial dialysis and blood sampling sites. 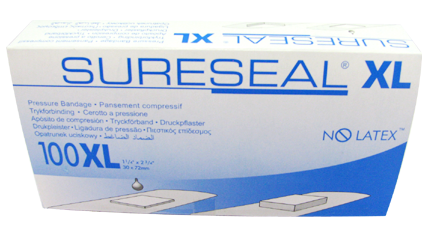 Sure Seal Bandages are suited for people with sensitive skin or latex allergies. Back by popular demand, East India Supplying SURESEAL CLASSIC Pressure Bandages, which contain latex Some patients prefer the faster acting adhesive of the SUHESEAL CLASSIC. Each box contains 100 bandages. Available in Large and X-Large. Phase-2, Road No1, KPHB, Kukatpally, Hyderabad.